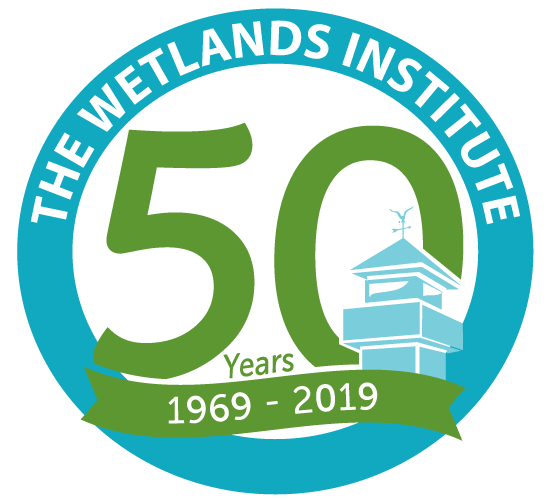 Stone Harbor, NJ – On February 17, 2019, The Wetlands Institute is celebrating the 50th Anniversary of its founding. The non-profit organization has a mission to preserve, protect and steward wetlands and coastal ecosystems and fulfills its mission through programs in research, conservation and education. The Wetlands Institute was founded through the efforts of Herbert Mills, Executive Director of the World Wildlife Fund. Mills and his colleagues noted the dramatic decline in commercial and recreational fisheries, the increase in water pollution, and the loss of important services that wetlands provide to communities resulting from the large-scale loss of wetlands to development and filling. He introduced the New Jersey Wetlands acquisition project in the fall of 1967, and within two years had acquired more than 5,000 acres of coastal wetlands in Cape May County. The initial acquisitions covered more than 10 square miles and extended throughout the back bays from Sea Isle to Wildwood and from the barrier islands to the mainland. The land acquisition costs exceeded $4.9 million, when converted to 2019 values. These lands and additional land acquisitions were transferred to the State of New Jersey for the creation of the Cape May Wetlands Wildlife Management Area forever preserving these wetlands. A 35-acre parcel was transferred to the newly incorporated South Jersey Wetlands Institute and is the site of The Wetlands Institute’s research laboratories, dormitory, dock, trail and walkway, auditorium for public programs and events, exhibit and classroom space, tower, aquarium and gift shop. The Wetlands Institute served as a field station for Lehigh University from 1969 until 1986 during which time there were hundreds of research studies completed on a broad range of topics on shallow bays, tidal inlets, wetlands, and the plants and animals that live here. In the ensuing years, The Wetlands Institute continued to flourish and establish research programs focused on diamondback terrapins and coastal birds, and expand public education programs. Undergraduate student internship programs have been a cornerstone of training programs and have benefited hundreds of students. Education programs have provided opportunities for people of all ages to learn about and discover the importance that wetlands have for our well-being. Students at Stone Harbor Elementary School have been working on terrapin conservation for nearly 30 years providing multi-generational connections to these ecosystems. The Wings N Water Festival, a 34-year tradition, helped establish The Wetlands Institute as an eco-tourism destination, and provided an economic boost to surrounding communities during the shoulder seasons. Today, The Wetlands Institute is a regional leader in wetlands conservation and remains at the forefront of vital wetlands research and education as we face crucial conservation challenges to marine life and healthy wetlands. The Wetlands Institute is at the epicenter of the most complex and critical challenges facing the region: climate change, rising sea levels, loss of biodiversity and wetlands habitat. To address these pressing challenges, The Wetlands Institute has initiated an intensive research, conservation and education program to encourage public support for wetland and habitat conservation. “The Wetlands Institute was founded with an understanding that wetlands and coastal ecosystems are immensely important and needed to be studied and protected. We have stayed true to that mission. Today, the threats to wetlands have never been greater with rising sea levels already impacting wetlands. The struggle to address these seminal issues and engage the public in understanding and mitigating these impacts is significant and The Wetlands Institute is responding to these needs” said Institute Executive Director Lenore Tedesco. After Hurricane Sandy, The Wetlands Institute constructed an elevated walkway over the marsh to enhance education opportunities and expanded monitoring programs that include detailed marsh elevation measurement stations to understand the impacts of rising sea level on local coastal resiliency. The Wetlands Institute works with multi-partner teams to test experimental techniques in marsh restoration, habitat enhancement and creation to stabilize natural areas and help stressed and declining animal populations. The Wetlands Institute is planning celebrations throughout the year including a weekend-long open house and celebration in June and free admissions days on the first Wednesday of June, July, August and September.